Every dedicated dog owner will one day ask, “what is the best dog food for my pet?” As you might guess, there is not one clear winner, especially with so many options available on the market. There are hundreds upon hundreds of foods claiming to be the well balanced, premium, top rated dog food. It can’t all be true. So what are some things you can do to narrow down your choices? Well, fortunately, some of the leg work has been done for you. 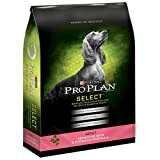 This list of top rated dog food includes diets that consistently receive good consumer reviews and recommendations. But first, you need to know a little bit about what qualities to look for in the best dog food. That starts with understanding the basics of what your dog requires to live a happy and healthy life. 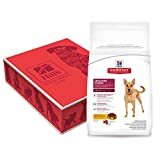 Skip to our top rated dog food! If you want to do the best thing for your pet, you should make a habit of checking the labels on your dog food (learn how to read a pet food labels here). They can tell you a lot about the quality you are getting in each bag. Also, some brands will change ingredients or formulas, so you want to be sure nothing suddenly changes from the ingredients that your pet needs. Some other things to consider on the label include the brand name or manufacturer of the dog food. Their reputation will reflect whether their kibble is made according to proper health standards. Also look for a nutritional adequacy statement and guaranteed analysis. If your pet food of choice provides complete and balanced nutrition, it will be listed on the label. If your pet food meets the smallest requirement for protein and fat, it will be listed on the label. So look at the label. Use that information to find the best dog food for your pet. For optimal health you need optimal, well balanced ingredients. That is what you get from Taste of the Wild. This is a great dog food for all breeds and all stages. It is made with lean, easily digestible proteins that not only provide great flavor, but are also a great source of energy. The benefits of this food will help promote a healthy immune system, healthy weight gain, and lean muscle development. The real meats, fruits and veggies guarantee the most natural diet. It also reflects the ancestral diet of dogs, taking them back to their wolf roots. The top listed ingredients include bison, lamb meal, chicken meal, sweet potatoes, and peas. This high quality dog food gets top ratings across the board from consumers. 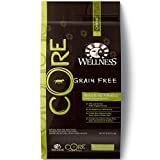 They say the grain free formula is great for dogs with sensitivity, it gives their dogs great energy, and has helped their pets maintain a healthy weight. It is a solid food for an affordable price, easily making it a top rated dog food. 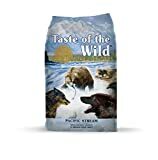 Yet another top rated dog food from Taste of the Wild. This one contains real salmon and smoked salmon to provide highly digestible proteins for your pet. The quality meats are only supplemented with real fruits and vegetables to make a complete and well balanced diet. Some benefits include a healthy immune system, healthy skin, a healthy digestive system, and overall wellness. The top listed ingredients include salmon, ocean fish meal, sweet potatoes, potatoes, and canola oil. Other quality ingredients include blueberries, raspberries, and tomatoes. Each tasty bite of this kibble will give your dog everything they need for a healthy body. Consumers say this Taste of the Wild dog food is the best grain free dog food for the price. It is also great for dogs with food allergies to common meats used in commercial dog food. No wonder this is a top rated dog food, good for all breeds and life stages. Another top rated dog food is this 100 percent grain free kibble. It is designed for dogs over one year old to help them maintain a well balanced, daily diet. Also, based on your pet’s primal history, your dog needs a protein based diet. This formula has only high quality animal protein to nurture your dog from the inside out. If you are looking to get back to basics for the health and wellness of your pet, then consider the ingredients of this well received dog food. The top listed ingredients include deboned turkey, turkey meal, chicken meal, peas, potatoes, and dried ground potatoes. Other ingredients include carrots, sweet potatoes, kale, broccoli, spinach, parsley, apples and blueberries. These are all easily recognizable, nutrient-rich ingredients making up the bulk of this dog food. There are no harmful ingredients like meat by-products, wheat, corn, or soy. There are also no artificial colors, preservatives, or flavors. Consumers call this the best dog food ever. It helped improve skin conditions and digestive problems in their pets. They loved the change it promoted in their dog’s demeanor and activity levels. 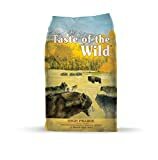 Another popular dog food from Taste of the Wild is this wetlands formula. The use of wild, roasted fowl is a hearty blend your dog is sure to love. It also packs a taste sensation like no other dog food. Made with real roasted quail, roasted duck, and smoked turkey this kibble will be irresistible to your pet. Not only is the food easily digestible, it gives them a supply of energy to suit an active lifestyle and a healthy weight. Top listed ingredients include duck, duck meal, chicken meal, egg product, sweet potatoes, peas, and chicken fat. Other listed ingredients include tomatoes, blueberries, and raspberries. With so many antioxidants and optimal amino acids, this top rated dog food will keep your dog healthy and happy. Consumers say even the pickiest of eaters have loved this dog food. They are certainly impressed with the top quality ingredients. They also love how it is a great choice for pets with allergies or intolerance to certain ingredients. You want a diet for your dog that will keep them at their best. For many dogs this means a grain-free diet because it is easier to digest. If you know your pet’s unique needs, then you might find that Purina Pro Plan has been specifically designed to meet them. Purina is committed to doing more for your dog though a healthy and nutritious diet. The Select formula is a limited ingredient diet meant for those animals with skin sensitivity or digestive intolerance. With only high quality ingredients, beginning with real salmon, your pet gets a nutritional and well balanced diet. Top ingredients listed include salmon, brewers rice, canola meal, oat meal, and fish meal. Also, this dog food is made without corn, wheat, and soy. It also doesn’t have any artificial flavors or colors. This food is great for promoting healthy skin, a healthy immune system, and an all around healthy dog. Consumers say this is a good alternative to many vet recommended formulas in treating allergens. The dogs love the taste and the owners love the health benefits of this top quality dog food. If your dog is less active and maybe needs to lose some weight, this is a top rated dog food just for them. Because this dog food is protein focused, featuring five USDA grade meat sources, it provides the right nutrition without excess fat or calories. The philosophy behind this recipe is based on the raw diet, without going full bore into raw foods. Instead the nutrient-rich proteins are supplemented with fruits, vegetables, oils and botanicals. The top listed ingredients include deboned turkey, turkey meal, chicken meal, potatoes, peas dried ground potatoes, and pea fiber. Compared to typical dry dog foods, this formula has above average protein, below average fat, and below average carbs. Consumers say they feel confident when giving this food to their dog. They don’t have to question the ingredients or the effects they might have on their pet. They did their research and picked the Wellness CORE Reduced Fat Formula because it fit the needs of their canine companion. 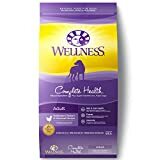 Another Wellness brand formula makes it into the list of top rated dog food. There are three animal protein sources to meet the high energy needs of your dog. There is also a healthy portion of Omega 3 and Omega 6 fatty acids to support a healthy coat and healthy skin. Also, supplemented with fruits and vegetables, it has the antioxidants your dog needs for healthy growth and development. This well balanced, nutritious diet is perfect for your small breed canine. Top listed ingredients include deboned turkey, chicken meal, salmon meal, oatmeal, and ground brown rice. It does not contain any wheat, meat by-products, or artificial colors, flavors, or preservatives. Consumers say it is the best dry dog food for small breeds. It has become a staple dog food for their pets and promotes excellent health and well being. Wellness is a brand they can stand by, and they would recommend this formula to all owners of small breeds. Sometimes making sure your pet is getting well balanced nutrition is a science. Finding the key nutrients and top quality ingredients for your dog can mean meeting precisely balanced nutrients to match the life stage, lifestyle, and special needs of both the age and breed of your pet. Hill’s Science takes all that into consideration. For more than 70 years the members of Hill’s Science Diet have dedicated their passion and drive into finding optimal pet nutrition. They do it because they know it can improve the health, energy, and quality of life in your pet. This Advanced Fitness formula has high quality proteins. It is easy to digest nutrition and contains the right fatty acids. Top listed ingredients include chicken, whole grain wheat, brewers rice, whole grain sorghum, and corn gluten meal. It is ideal for active breeds. Consumers say their dogs would highly recommend this dog food. Though it is slightly more expensive than other brands, you get what you pay for and that is top quality. There is no better way to prepare a meal for your pet than to have a renowned chef prepare it for you. It is exactly what you get with Rachel Ray Nutrish. This limited ingredient dog food is full of only top quality proteins, fruits, and vegetables. Not to mention, the limited ingredients make it easier to control food allergies or intolerance. The top listed ingredients include lamb meal, brown rice, ground rice, dried beet pulp, and poultry fat. Just as notable, are the things not included in the recipe. There is no corn, no wheat, and no soy. There are also no artificial colors, flavors, or preservatives. Consumers say this is the best dog food ever and they would give it higher ratings if they could. It is healthy for their dogs and helped with their allergies. Their pets lick the bowls clean, obviously happy with this kibble. The Adult Formula of Newman’s Own is a professionally blended recipe of chicken and brown rice. With the ideal protein to fat ratio, this top rated dog food helps support the nutritional needs of your dog without the added calories. Also, the organic ingredients make it perfectly safe for all dogs in all life stages. The top listed ingredients include chicken, organic barley, organic oats, organic peas, and chicken meal. There are no herbicides, pesticides, or artificial fertilizers used on the organic ingredients. There are also no chemical additives or preservatives in the food itself. If you are looking for complete, balanced nutrition for your pet that is free of all the “bad stuff,” then this is the best dog food on the market. Consumers say Newman’s Own is a brand they trust. Those who choose this food have become long-time users of the brand. It is a high quality pet food beloved by both dog and owner. Grain based diets are not ideal for dogs. In fact, they make little nutritional sense. Things like corn, wheat, and oats are common fillers in commercial dog foods. However, these should never be the first ingredient listed in a top rated dog food. The carbohydrates in these foods, though they are a great source for energy, are difficult for your dog’s digestive system to break down. Your pet lacks the proper enzymes, and often these ingredients lead to health problems. Proteins: You need to find a great dog food with a protein base. Just as their ancestral history dictates, your dog needs meat. Besides water, proteins are the most essential nutrient to your pet. These are the basic building blocks for your dog’s growth, health, and lifestyle. Proteins are essential for cell development, enzymes, hormones and antibodies. They are also needed for muscles, tissues, and organs. Animal proteins like chicken, beef, lamb, fish or cooked eggs should make up the number one ingredient listed in top rated dog foods. Fats: Aside from proteins, your dog also needs healthy fats. They are what provide your dog with energy. In fact, the right fats provide twice as much energy as carbohydrates or proteins. Some essential fatty acids for dogs include omega 3, omega 6, and Linoleic acid. Fats, aside from nutritional value, also help to insulate and protect your pet’s body and organs. Carbohydrates: These ingredients do play a vital role in your pet’s health. Carbohydrates, specifically glutens, are what give energy to your pet’s organs. This is why your pet will not receive a full nutritional value from only protein sources like raw diets. Also, one form of carbohydrates includes fermentable fibers. Things like bran, beet pulp, and wheat are great for digestion and promote a healthy gut. They just should not be overused, especially in young, growing, and energetic dogs. Vitamins and Minerals: Last things to look for in top rated dog foods are the vitamins and minerals. Often these nutrients cannot be synthesized by your animal and can only come from your pet’s diet. Vitamins help the body function and minerals make up your pets bones, teeth, and metabolic functions. All necessary for growth, development, and maintenance. A healthy dog getting proper nutrition will look like one. Their coats will be healthy, their skin will be perfect, and their weight will be ideal. Skeletal dysfunction, oral health issues, and gastrointestinal problems will all but disappear. Other benefits of a nutritious and well balanced dog food are better immune systems, improved mobility, and weight management. In the end it is up to you to go through the list of top rated dog food and find the right choice for you and your canine companion. Sometimes this process might require a little trial and error. Focus on finding the right ingredients that prove most beneficial for your pet. You may also have to be on the lookout for allergens or food sensitivities. 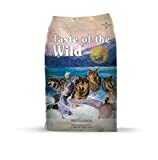 My huskies are fans of the Taste of the Wild Dry Dog Food. They were originally eating Purina Pro Plan but didn’t like it was much as they do TotW. Newman’s Own has been our pick for the past 2 years. Our German Shepherd really loves this formula. He is picky, and it was one of the first foods that we found that not only agreed with his tummy, but also pleased his taste buds! Just remember, every pet is different! I never really knew how much went into choosing a great dog food formula. The problem is that there are so many to choose from. I feel that I haven’t done nearly enough when it comes to research. I want the best for my little buddy, so thanks for this great information! I think we are going to give Wellness Core a try.